Every single day, billions of people around the world use social media to connect, debate, learn and share. As well as for everyday communications, social media platforms can help give a voice to the voiceless by raising the profile of some of the most marginalized groups in society. They can also be an important place to address social injustices; just last month we saw women from all over the world use social media platforms and #metoo to expose the violence, abuse and harassment they face offline. On the other hand, the widespread inequality and discrimination against women that remains embedded in society is increasingly being replicated online. Acts of violence and abuse against women online are an extension of these acts offline. Anecdotally, we know that online violence and abuse is widespread but there is a lack of quantitative data about the breadth and depth of online abuse women experience and its impact. · Online abuse can have a serious psychological impact with women reporting stress, anxiety or panic attacks as well as lower self-esteem as a result of the abuse. Around two-thirds of women who had experienced abuse or harassment online in the UK (67%), New Zealand (64%) and Italy 68%) stated a feeling of apprehension when thinking about using the internet or social media. Social media can be a toxic and frightening place for women. Amnesty’s previous research on this issue shows how women parliamentarians in the UK, especially those facing multiple and intersecting forms of discrimination, experience targeted abuse online. However, it’s important to stress that online abuse affects women from all walks of life. Amnesty’s poll found that 64% of the women surveyed believe ‘online abuse or harassment of women is common nowadays’. This indicates that women’s experiences of online abuse are not isolated incidents but in fact are part of a wider trend of both online and offline discrimination against women. 23% of the women polled said they experienced abuse or harassment online. In the USA, New Zealand and Sweden, almost 1 in 3 women stated they had experienced online abuse or harassment. In the US, New Zealand (both 88%), UK (90%), Italy and Spain (both 89%), almost 90% of women agree that online abuse is harmful to women. These responses show that for so many women around the world, the internet is simply not a safe space. Behind every number in this poll is a story. Although the statistics are shocking, I also wanted to hear more about the types of abuse women receive and how it makes them feel. So, I interviewed women about their experiences of online abuse, including some women with a big public profile. As I poured over the dozens of excel worksheets of the poll’s findings, my interview with Pamela Merritt, an American sexual and reproductive rights activist and blogger stuck out. “As a blogger, I’ve faced it all. I’ve had death threats, people posting racist, sexist or homophobic comments, and a lot of push back that is anti-abortion but in a hostile and violent way, like, ‘you support abortion so you deserve to die’. Pamela’s experience of receiving physical or sexually violent threats is not unique. Of the women polled who stated they had experienced abuse or harassment online, 1/4 (26%) had received threats of physical or sexual assault. Almost half (46%) of the women who experienced abuse or harassment said it was sexist or misogynistic in nature. Privacy violations such as ‘doxxing’ and sharing sexual and private images of a woman without her consent were also forms of abuse or harassment experienced by women. 1 in 6 (17%) of the women surveyed across all 8 countries who had experienced abuse or harassment said that their personal details had been posted online, with 8% saying that intimate images had been posted without consent. Additionally, almost 1 in 3 (29%) of women in the US who experienced abuse or harassment online said their personal details had been posted online. Earlier this year I also spoke to Laura Bates, founder of the Everyday Sexism Project. Like Pamela Merritt, Laura has built a public platform speaking out against daily sexism and misogyny experienced by women and uses the internet to advocate for women’s rights. We had a long phone conversation where she spoke candidly about the various forms of online violence and abuse she faced, the different platforms where it had taken place, and the changes she has made to her everyday interactions as a result. After our conversation, I returned to my desk feeling shaken. It was not the last time during the course of this research that I found myself overwhelmed by what I was hearing. It was clear to me after that phone call that the true toll of online abuse is incredibly underestimated. Laura explained how her experience of online abuse has evolved over the years. For many women like Laura and Pamela who have experienced abuse online, especially in the form of direct or indirect threats of violence, there is a very real fear that such threats of violence will transpire offline. Our poll found that of the women polled across all countries who experienced abuse or harassment online, almost 60% had received abuse or harassment from complete strangers. Alarmingly, 41% of women who had experienced online abuse or harassment said that on at least one occasion, these online experiences made them feel that their physical safety was threatened. Both Pamela and Laura explained to me that such fear is rooted in the fact that it only takes one person to follow through on a threat. This bears repeating — Pamela has reconciled herself to dying for expressing herself online. The gravity of this problem has been severely underestimated. The psychological implications of experiencing online abuse remains under-researched, and as a result, understated. There is a misconception that because the abuse is online it can simply be ignored or shrugged off. However, in the UK and US, more than 3 times as many woman disagree (63% and 61%) than agree (19% in both countries) that online abuse and harassment can be stopped by just ignoring it. This rises to almost 6 times as many women who disagree in Denmark (64% disagree, 11% agree). Our findings also support this analysis. On average, 58% of women in the countries polled said they had felt apprehension when thinking about using the internet or social media after experiencing abuse or harassment. Many women I interviewed spoke about the profound psychological implications of online abuse, and how it negatively impacts the way they navigate both their online and offline realities. Laura’s reaction to the violence and abuse she has experienced online is not isolated. In fact, of the women polled who experienced abuse or harassment online, more than half (56%) stated that they were less able to focus on everyday tasks as a result. In addition, more than half of women (55%) said they also experienced stress, anxiety or panic attacks after receiving online abuse or harassment. The poll also showed that online abuse and harassment has a serious impact on women’s self-esteem and self- confidence and led to an overwhelming feeling of powerlessness. In all countries, a large amount of women who experienced online abuse or harassment reported lower self-esteem - ranging from 43% in Italy to 70% in New Zealand. Across all countries, around 2/3 of these women stated feeling a sense of powerlessness after experiencing online abuse or harassment. The psychological impact of online abuse is real and Dr. Emma Short agrees. She told me about a study she conducted in 2010 on the impact of cyberstalking — that is, when a person is engaged in a persistent course of conduct online abuse that’s causing alarm, distress and fear to another person. 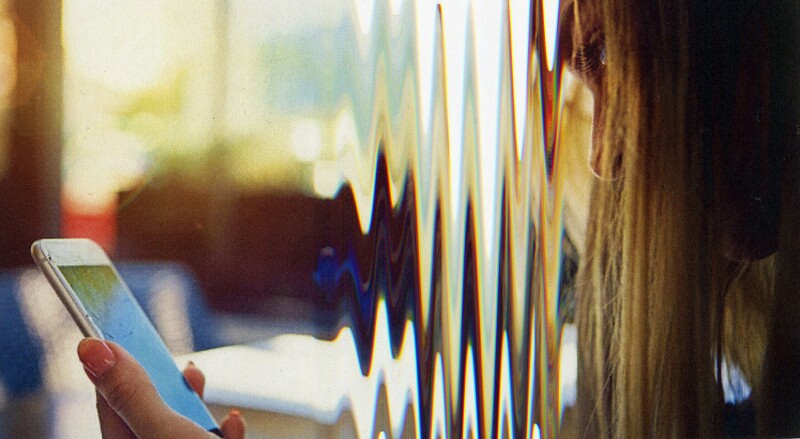 Another parallel between online and offline abuse is the silencing effect it has on women. Online abuse against women is increasingly being used as a tactic to publicly exert power over women and prevent them from expressing themselves freely. Our poll showed that online abuse has a chilling effect on women’s freedom of expression. Between 76 % to 85% of women polled indicated that they are Facebook users. 1/10 women in New Zealand were Twitter users with this rising to around 1/3 of women polled in Spain. 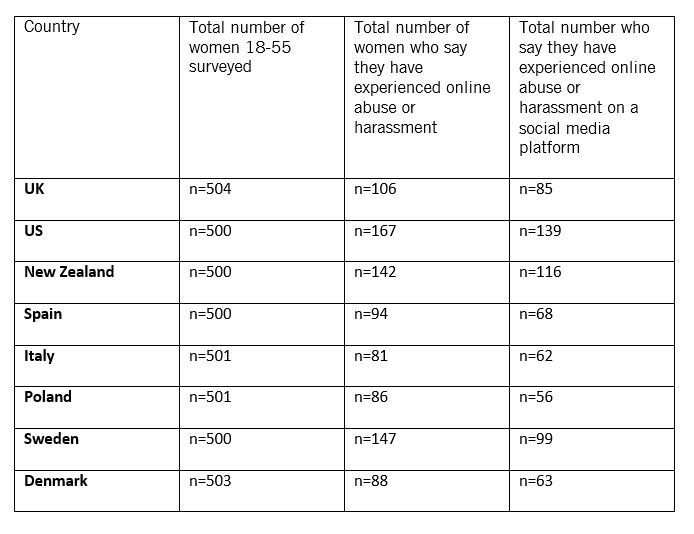 These figures are significant when considering that of the women polled who experienced online abuse or harassment, more than three quarters (76%) across all countries made some changes to the way they used social media platforms. This figure shows just how many women alter their everyday interactions online as result of online abuse. The specific ways in which women modified their online interactions after experiencing abuse or harassment varied between women increasing privacy and security settings or making changes to the content they post - but the number of women who made changes to the posting or sharing of expression or opinions is deeply troubling. 32% or almost 1/3 of women across all eight countries changed the way they express themselves online in response to abuse or harassment. In New Zealand this reached 44% of women. In the US and UK around 1 in 3 women made changes to the content they share or express online as a result of abuse or harassment. Despite this, both women emphasized how important social media platforms are for amplifying women’s voices, especially those with multiple and intersecting identities. Tackling online violence and abuse on social media platforms and protecting women’s rights online requires resources, transparency and coordinated action from social media companies and governments. It’s time to move beyond mere lip-service and continued acknowledgement of the problem to concrete actions and solutions. Social media companies have a responsibility to respect human rights and this includes the right to freedom of expression. This means ensuring that the women who use their platforms are able to do so equally, freely and without fear. Our findings show that many women feel the response of social media companies to online abuse has been inadequate. Almost 1/3, or 32%, of the women polled who use Facebook stated that the company’s response to dealing with abuse or harassment online was inadequate. Twitter did not fare much better. Almost 30% of women polled who are Twitter users stated the company’s response to abuse or harassment was inadequate, including 43% of women users in the UK and 41% in Sweden. These figures show that social media platforms have a lot more work to do when it comes to increasing the confidence and trust of their women users. The policies of social media platforms explicitly state that they do not tolerate targeted abuse on the basis of a person’s gender or other forms of identity. But our poll findings indicate they may not be adequately enforcing these standards, and this should be a priority. Social media platforms should also enable and empower users to use individual security and privacy measures such as blocking, muting and content filtering to curate a safer and less toxic online experience. Platforms must also ensure that moderators are trained in identifying gender and other identity-related threats and should regularly report on the scale and types of online abuse users experience, as well as the actions they have taken in this regard. Governments also have an obligation to protect women from human rights abuses. Amnesty is calling on governments to ensure adequate laws, policies, practices and training are in place to prevent and end online violence and abuse against women. The views of women themselves show that governments in all countries polled have a lot more work to do. On average, half of all women polled stated the current laws to deal with online abuse or harassment were inadequate, with close to 70% of women stating this in Italy and Sweden. In the USA, UK and New Zealand, around 1/3 of women stated the police response to abuse and harassment online was inadequate. Governments must urgently address this increasingly worrying issue by challenging harmful and negative gender stereotypes, investing in training on gender and other identity-based online abuse, and ensuring robust and transparent ways of reporting the problem are in place. However, governments must not be over-zealous in their response. It is critical that no undue restrictions or penalties are placed on the legitimate exercise of freedom of expression. Tackling online violence and abuse must not be used an excuse to reduce the enjoyment of freedom of expression. Similarly, criminal sanctions against companies who fail to remove abusive content are dangerous and risk causing more harm instead of addressing the core of the issue. Amnesty’s poll shows that a large proportion of women in the countries polled believe social media platforms and governments alike are inadequately dealing with an issue that is both driving women off social media platforms and deterring women from speaking freely online. Without urgently addressing this serious human rights issue, we risk further silencing women during a time when their voices — to some extent — are finally being heard. “We need to take care of ourselves — emotionally — but this is the front line and we must not cede that space”. This research was carried out by Ipsos MORI using an online quota survey of 500 women aged 18–55 in each country, via the Ipsos Online Panel system.